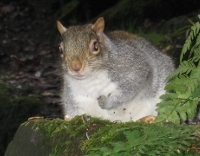 Grey SquirrelThe grey or American squirrel is a major pest and is required to be controlled due to the risks of disease and damage to the fabric of the building. West Lothian Council provide a trapping service for Grey Squirrels within houses as they can cause a lot of damage and may put the health of occupiers at risk. Please note: that we will only perform squirrel trapping within a property and not in open ground or gardens due to the danger of trapping other animals or birds. The red squirrel is native to the UK and is fully protracted under law and any queries about red squirrels should be addressed to Scottish Natural Heritage. The council does not have a legal duty to provide a pest control service to control grey squirrels. Legally, we will require to have access to your property at least once every day but preferably twice (AM and PM). The traps have to be checked once and preferably twice a day legally. This should be discussed with the pest control officer on his first visit. We cannot leave traps set over the weekend for this reason. Squirrel trapping for non domestic premises are £438.78 (Incl VAT) per week. We aim to attend calls within 5 working days. We set the traps on the following Monday morning to your call and therefore a weeks trapping will consist of visits throughout that week to check traps and dispose of any trapped animals. The trap would then be removed on the afternoon of the Friday of the same week. This would then constitute one weeks trapping. Squirrels are normally trapped within the first week however, re-infestation or trap shyness may have an effect on the overall length of time it requires to remove the problem. Advice will be given as to access points and how to help reduce the probability of squirrels getting into your property in future. The pest control officer who attends will be able to advise, and in some circumstances, seal the entry at an additional agreed cost.